A well designed diet is the foundation upon which optimal training and performance can be developed. However, as long as competitive sports have existed, athletes have attempted to improve their performance by ingesting a variety of substances. This practice has given rise to a multi-billion-dollar industry that aggressively markets its products as performance enhancing, often without objective, scientific evidence to support such claims. While a number of excellent reviews have evaluated the performance-enhancing effects of most dietary supplements, less attention has been paid to the performance-enhancing claims of dietary supplements in the context of teamsport performance. Dietary supplements that enhance some types of athletic performance may not necessarily enhance team-sport performance (and vice versa). 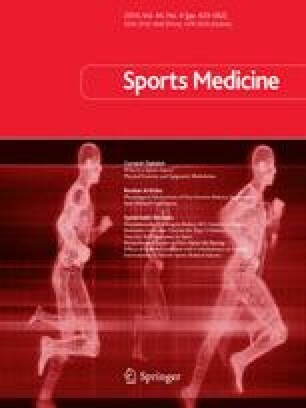 Thus, the first aim of this review is to critically evaluate the ergogenic value of the most common dietary supplements used by team-sport athletes. The term dietary supplements will be used in this review and is defined as any product taken by the mouth, in addition to common foods, that has been proposed to have a performance-enhancing effect; this review will only discuss substances that are not currently banned by the World Anti-Doping Agency. Evidence is emerging to support the performance-enhancing claims of some, but not all, dietary supplements that have been proposed to improve team-sport-related performance. For example, there is good evidence that caffeine can improve single-sprint performance, while caffeine, creatine and sodium bicarbonate ingestion have all been demonstrated to improve multiple- sprint performance. The evidence is not so strong for the performanceenhancing benefits of β-alanine or colostrum. Current evidence does not support the ingestion of ribose, branched-chain amino acids or β-hydroxy-β-methylbutyrate, especially in well trained athletes. More research on the performance-enhancing effects of the dietary supplements highlighted in this review needs to be conducted using team-sport athletes and using team-sportrelevant testing (e.g. single- and multiple-sprint performance). It should also be considered that there is no guarantee that dietary supplements that improve isolated performance (i.e. single-sprint or jump performance) will remain effective in the context of a team-sport match. Thus, more research is also required to investigate the effects of dietary supplements on simulated or actual team-sport performance. A second aim of this review was to investigate any health issues associated with the ingestion of the more commonly promoted dietary supplements. While most of the supplements described in the review appear safe when using the recommended dose, the effects of higher doses (as often taken by athletes) on indices of health remain unknown, and further research is warranted. Finally, anecdotal reports suggest that team-sport athletes often ingest more than one dietary supplement and very little is known about the potential adverse effects of ingesting multiple supplements. Supplements that have been demonstrated to be safe and efficacious when ingested on their own may have adverse effects when combined with other supplements. More research is required to investigate the effects of ingesting multiple supplements (both on performance and health).